This one bedroom corner apartment has hardwood floors accented with Oriental rugs, and three sets of floor-to-ceiling French doors, which open onto a wrap-around balcony. 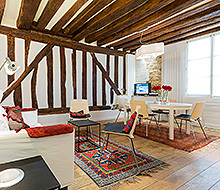 Located in a historic building, this 650sqft apartment has been recently renovated. The living and dining areas share the main salon. The living area is furnished with a comfortable white couch paired with two classic armchairs, dark wood side tables, and oriental lamps and rug. 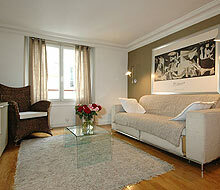 This room looks out over Paris rooftops through two sets of French doors, which all lead to the apartment’s balcony. The room also supplies a small office area with a flat screen television and an Ipod/Iphone speaker system. The dining area offers window view and seating for four. The brand new Italian kitchen features German Neff appliances, which include a floor to ceiling refrigerator, flat electric stovetop and espresso machine. The large eastern facing double window given this room a nice natural light. The bedroom has original wooden ceiling beams, a queen-size bed, dresser, luggage racks, and bedside tables. The bedroom also offers access to the balcony through French doors. This section of the balcony is eastern-facing and so offers lots of light as well as a small seating area. The bathroom a bathtub and tiled shower, dual washbasins, towel warmer, and extra closet space. The apartment also has a detached W.C.
A fine experience. 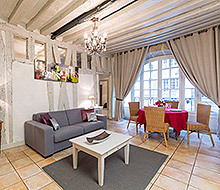 Well-appointed, charming apartment in a superb location.